Today's my day off. I'm considering planting some tomato plants because I'd like to try my hand at canning the little guys. 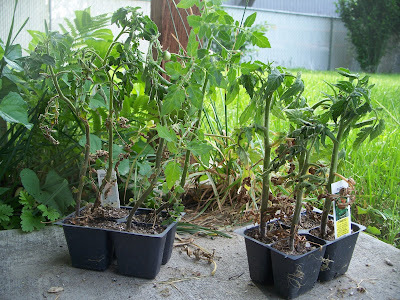 I've had the tomatoes sitting in their original black containers for about three weeks and often forget to water them. Everytime I go to plant them, I wonder if I'll dig up a slimy worm and then I rationalize, "The soil is probably too wet. I'll do it later." My dear, worms are your friends. They make the soil nice for the plants. They are not gross. P.S. ~ Love your blog!